Cube the cornbread and pop into a large mixing bowl. Melt 2 tablespoons of butter in a large skillet and sweat the onions, celery, and serranos over medium heat. When the mixture softens and smells great, remove it from the heat and allow to cool. Add the veggie mixture, chopped chorizo, and thyme to the cornbread cubes. Toss and drizzle with olive oil. Slowly pour 1/2 cup of the chicken stock over the stuffing and lightly toss to combine. The stuffing should be moist but not wet so you may need a little bit more depending on the dryness of the cornbread. Season with salt and pepper to taste. To spice it up a bit more, add a touch of cayenne or smoked paprika, too! Pour the stuffing into a 9×13 baking dish and top with a couple of pats of butter. Cover loosely with foil and bake at 350F for about 20 minutes, or until warmed through. Remove foil, boost oven to 40oF and bake for another 10 – 15 minutes until the top browns and crisps up. Thank you, Kyrsten, for this amazing recipe! Here is her story: For many years, my husband and I cooked for large holiday family dinners, steeped in all the traditions. A couple of years ago, we had our first holiday dinner just the two of us, so we mixed it up! I incorporated the flavors from my Southern childhood and came up with this recipe. 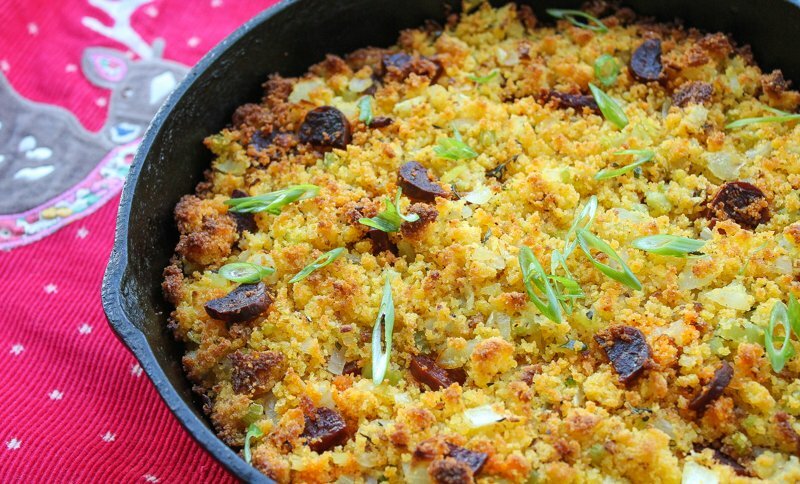 It’s so good it has replaced the traditional family stuffing at Thanksgiving! We opt not to stuff the bird, but cook this in a baking dish to get lots of browned crunchy bits (all the better to soak up the gravy)! Sometimes, I roll this stuffing in a pork loin and bake (skipping the bird altogether). I love having leftovers of this stuffing for breakfast with a poached egg on top.